§28-815 B. Persons riding bicycles upon a roadway shall not ride more than two abreast except on paths or parts of roadway set aside for the exclusive use of bicycles. But since Arizona cyclists are subject to all the other bicycling rules that doesn’t really matter. As a practical matter, most places where it would matter around here are urban arterials that have been built with narrow, multiple lanes. Because they are narrow; the ride-right rule, §28-815 A does not apply. Because they are multi-laned; the impeding rule, §28-704 C does not apply (and §28-704 A only applies to motor vehicles, not all vehicles). Another common scenario are rural two-lane roads with narrow-lanes; any slow driver (including bicyclists) may impede (that is to say they may be impeding other traffic without committing any violation) so long as they comply with 28-704C, the duty to pull out/off roadway when safe. So, the bottom line is if you would be allowed to impede when riding single-file — e.g. and most often because of a lane that is too narrow to share — then you may also impede two abreast. 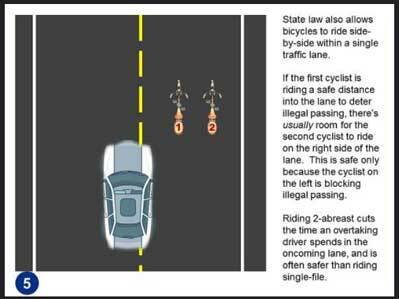 Also note that it is always illegal to ride more than two abreast in the roadway, regardless of its impact on impeding, or anything else. Other gray areas of abreastness: how does one cyclist pass a pair of cyclists riding two abreast? Does riding two abreast in the roadway, abreast of a third cyclist on the shoulder equate to three-abreast? What about a bicycle lane — is a bicycle lane part of the roadway? It also occurs to me that groups of cyclists often appear from behind to be operating many-abreast when in fact (as seen from above, say) they are no more than two abreast. As illustrated and noted in the slide above, there are safety advantages for both bicyclists and motorists when two or more bicyclists choose to ride two-abreast. Because it makes the bicyclists more visible to motorists (from any direction) and allows overtaking motorists more time to plan, eliminating abrupt movements that may be unsafe. 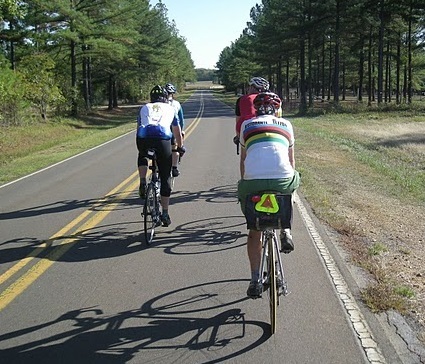 An excellent longer-form treatment of the subject can be found at BikeWalkNC.org: Why Cyclists Ride Two Abreast. 36 CFR § 4.30 Bicycles. (4) Operating a bicycle abreast of another bicycle except where authorized by the superintendent. I’ll make mention here, although it’s not related to two-abreast, the Federal Gov’t has a so-called “mandatory sidepath rule”; and sadly it’s very recent, 2011 as part of S. 1813 Moving Ahead for Progress in the 21st Century Act. There’s a longer, more thorough rundown of this obnoxious law on John Allen’s page. you forgot 28-704 section C.
This usually combats the me me me and I can’t pass. azbikelaw replies: well, I wouldn’t say I forgot it, i have a link to it, along with a description. I’m sure this has happened to most cyclists and it certainly wasn’t my first time – but I think it should be reported. I started to contact Surprise Police, then thought perhaps the Coalition could be more effective. Three of us, safety-conscious retirees, were riding south on Bullard shortly before 7 am today. The street is four lanes, very little traffic. The two behind me were riding side-by-side. A police car started following us closely, although she could have easily pulled into the other lane and passed. At the stop light she came alongside and informed us that we had to ride single file at the far right; we were not allowed to take up a lane. She was polite enough and probably believed she was correct. We acknowledged her and rode away in single file, although we knew Arizona law permits two abreast riding. I looked at the Surprise legal page and found nothing regarding riding single file (though I could be mistaken), so I assume they should follow the Arizona rules. The point is education! Obviously police officers should be familiar with the law. And in the latter reference, i would especially point out the Pima County Attorney’s / Sheriff’s office memo that is linked there, it which deals directly with this issue — in short there were on-going problems with PCSO wrongly ticketing the “left” two-abreast cyclist. Surprise, of course isn’t in Pima county; but all of the analysis and reference are to state statute. Also of note in the second reference is two specific two-abreast cases in pima county (Roberts and Piscopo) who were ticketed and found responsible at trial for violating 815A (not riding far enough to the right), despite it being a “narrow” lane. Both cases were reversed on appeal. It’s pretty sad that police and (lower court) judges get this so wrong. So the only question is, was the lane in which you were riding at the time “too narrow for a (one!) bicycle and a vehicle to travel safely side by side within the lane”? Around where I live, somewhere between most, and the vast majority of lanes are clearly too narrow; but obviously this varies.